How Can I Reverse Osmosis If I Don't Know How To Osmosis? With a better understanding of reverse osmosis you'll know whether this is the right solution for your water problems. It's a great process for making very clean water but it's not the answer to every water problem. To understand reverse osmosis (RO) it's best to have an idea what osmosis is. I read many descriptions of the osmosis process that were littered with words like: hypotonic, isotonic, hypertonic, and osmotic pressure. Rather than boring you with those details I came up with my own overly-simplified analogy to help describe the process. Keep in mind, even if my description isn't 100% scientifically correct, I believe it really will help you understand the process. First you have to accept the proven principle that a less-concentrated solution (like pure water) will always be drawn through a semi-permeable membrane towards a more-concentrated solution (like sea water). My overly-simplified example will use a leaf on a tree and a raindrop to explain osmosis. We have to agree on two things; the skin on the outside of the leaf is not waterproof, and the water inside the leaf is full of minerals or nutrients. 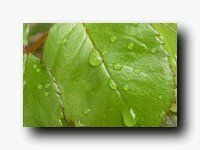 If a raindrop, which is nearly pure water, landed on the skin of that leaf and sat there for a while, the natural tendency is for the highly-mineralized water inside the leaf to draw that raindrop through the skin of the leaf. Now the pure water combines with the mineral water inside the leaf. I'm no biologist so please humor me; let's say that it really works like that. Now if we reverse nature's process by putting pressure on the concentrated solution, the less concentrated solution will be forced through the pores of the skin. You'll end up with purified water on the outside of the skin and an even more concentrated solution on the inside of the skin. In an RO system that skin is a man-made membrane. It's made of a thin plastic-like sheet with very tiny pores. So tiny that dissolved minerals can't pass through them. To keep these tiny pores from plugging up there is a stream of water passing over the surface of the membrane that flushes the minerals down the drain. Without the drain water these membranes would constantly need replacing. A little water down the drain saves a lot of money in membrane replacements. The reject, or waste water, is what keeps the RO from being a good all-around filtering system. An RO installed on the incoming water line could double, and almost quadruple, your water bill. That's why we usually limit RO water usage to drinking and cooking water in most homes; then you will have only a few gallons of reject water a day. Many contaminants, and I'll use arsenic as an example, may not be harmful in your usage throughout the home, but you certainly don't want them in your drinking water. An RO system is one of the best methods for reducing arsenic levels in your drinking water. So you might consider an RO system for really clean drinking water, but it's not likely you'll want to treat all the water in your home with a reverse osmosis system.